Luckily, this incremental progress quickens when certain principles are understood, and ingrained in our mindset. What follows are the core principles of financial independence we have learned after 18 years of providing financial advice and guiding clients as they move from financial insecurity to financial security. Money assists with the achievement of goals, but is not THE goal. Money is not accumulated and invested with the object of getting as big a pile of money as possible to leave at death. Instead, the value of your money lies not in its monetary value, but in what opportunities/feelings it creates - such as security, freedom, contribution, choice, self-esteem, etc. Having a purpose (i.e., having a “Why”) for savings/investing can include the type of lifestyle you want to maintain, potential employment changes, new experiences, charitable giving, or just the security of financial independence. Why is money important to you? We can have anything we want - but we can't have everything we want. Regardless of our incomes, we are all constrained and can’t possibly have it all: a big house, private schools, early retirement, emergency cash cushion, elite college, higher lifestyle, luxury automobiles, country clubs, travel, second homes, etc. Everything is a trade-off with one choice impacting the others. Don't trade away important choices such as needed insurance for desirable choices. These choices should not be made day to day, but instead should be made after reflecting on your deeply held personal values. 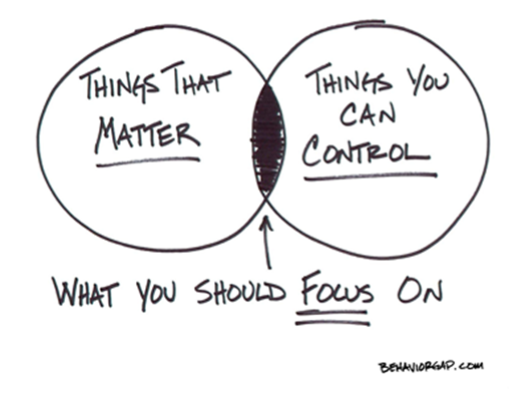 We must discover – and work towards – what is truly important in our lives and plan accordingly. This is done by identifying our deeply held values. Knowing who we are and what we value, makes it easy to save or spend money on the things that are truly important. It also makes it easier to ignore the "bright shiny objects" that distract us from our purpose. In fact, knowing who we are and what we value makes all financial decisions easier. Imagine how confident and secure you would feel if you were absolutely certain about who you are, what you believe, what you want, and where you are going! Knowing this, you would know what decisions would need to be made in order to get what you want, never swayed by friends or society. You would be better able to withstand the forces that try to bully you into making poor financial decisions. As long as you make value-based choices, you will propel yourself towards your goals. Strive to make good prudent decisions (inputs) and success (outputs) will eventually follow (perhaps not immediately). A correct decision can lead to a bad result (“stuff happens”). That is not a mistake; that is just life. We have control over our decisions, but not over the immediate outcome. Therefore, never stop your focus on making good, prudent decisions and let go of the desire for immediate positive results. Good decisions (such as diversification or a move to a more conservative portfolio) may be seen as a poor decision in one month and a great decision in one year. By focusing on making prudent decisions each day, there is a much higher probability the future will take care of itself. Many people spend too much time evaluating, discussing, or worrying about the factors that are not under their control such as interest rates, war, recession, etc. Instead, people should focus their efforts on the things they can control and that matter, such as saving, earning money, maintaining their health, lowering their taxes, and buying the right priced home. This allows them to focus their energy and efforts on the things that will make a big difference in their financial lives. Create some momentum and begin the lifelong habit of saving at least 10% of your income when you are young (more if starting later). Start saving as early as possible so you can buy yourself the financial freedom to pursue your passions in life. It is ok if you start out saving small dollar amounts (and this will seem boring), but soon enough, these small habits will become ingrained in your life, and the financial impact will snowball as you continue to save larger dollar amounts (and this will be exciting). Remember, what you spend today creates today’s lifestyle, but what you save today creates tomorrow’s opportunities. Your future-self will greatly appreciate the financial security you created by building savings habits early. We must all live within our means by spending less than we earn. This is because you can’t simultaneously act rich and become rich. Living within your means is about being true to who you are and where you are financially. This is especially important when income growth is rapid as you must restrict the tendency to allow your lifestyle to creep up to match your growing income. Keep a large gap between your income and your spending. If you have more than $1.00 of rolling credit card debt, you are living beyond your means. If you want to live within your means, use cash instead of credit cards. Credit cards only make it easy to spend money you don't have on things you don't need, and likely can't afford. Supporting your lifestyle over a 35-year retirement will be the most expensive goal you will have. Because of its size, you must keep your priorities on your retirement savings even in the face of college costs or other goals. Unlike these other goals, retirement is not optional, and it can't be financed, or paid for out of employment income since you won't have any! Don't be penny wise and pound foolish. Being frugal year-round, then spending $45,000 on a car that you did not prepare for (and can’t afford) is counter productive. It is not the little stuff that will blow your budget. It is almost always the big stuff that you have not prepared for, such as home repair, auto replacement, home improvement, medical bills, etc. If you have a surprise emergency every few years (or more often), it is not a surprise! Therefore, plan for and begin to save for these big expenses you know are inevitable. Do this now by setting aside something (even if small) each month for each of these inevitable "surprises". You must be fully committed to improving your financial life. While your circumstances might not always be your fault, improving them is always your responsibility. For example, if "Wall Street" triggers a stock market crash, they may be at fault, but it remains your responsibility to get back on track. Don’t blame anyone or anything else for your financial situation and never expect to be bailed out by family, the lottery, or the government. Commit to always being responsible for your financial life. So many Americans live on the edge - the edge of job loss, divorce, disability, stock market crash, or bankruptcy. They hover so close to the edge that financial disaster is only a push away - that can come anytime without warning. This is one reason why it is so important to maintain a margin of safety in order to protect yourself from the unexpected. This is best done by maintaining an appropriate amount of totally safe cash. Cash provides the margin of safety needed to allow you to start a business, weather a job loss, get by until your disability kicks in, stay at home with the children, or put a down payment on a second home. For many, the biggest asset in their "portfolio" is their future income potential. A high income (without the associated high lifestyle) puts you on the path to financial security. Therefore, leverage your future earning power by building your skills, experience, knowledge, network, and value. To earn more, you must be worth more to the market. Nothing can wipe out your hard earned savings than a big mistake, medical bill, disability, or death. Get the right insurance and legal documents in place at the right time, using the right professionals. For those on the road to financial independence, the income tax bill can be the largest recurring expense they are faced with. Overpaying income taxes results from the short-sighted view that taxes are a once-a-year preparation task, rather than tax-planning as a pervasive feature of our lives. Unlike the passive nature of tax preparation, tax planning is an anticipatory, active process where you look deeply into your current year tax situation as well as forward into your multi-year tax situation. As tax advisors, we know from personal experience the significant savings that can occur from avoiding tax mistakes or taking advantage of understanding how tax rules apply to our clients. When you invest, you are investing in the economic progress of the world. Therefore, you must have a resounding faith in this future. Having faith means you are investing in something you believe in. Second, you must have patience - the ability to delay expectation - as you wait for positive returns to unfold. This is done by having realistic expectations for future returns, and avoiding investing any money you may need in the next five years. Third, you must have a strong, well-defined, and fully embraced investment philosophy. Your investment philosophy cannot change when the markets change. It will keep you unswayed by the outside forces hell bent on getting you to "act" (i.e., trade). Finally, with faith, patience, and a philosophy, you will have the needed discipline to stick with your investment plan when the going gets rough. 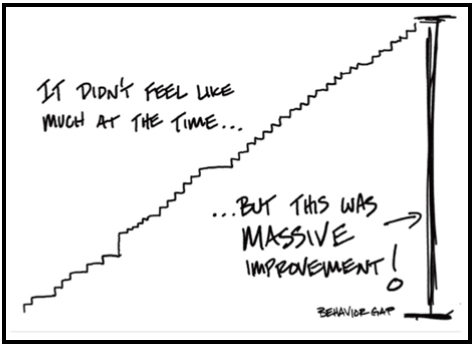 Discipline is the ability to NOT act as you wait patiently through a painful market and see the value of your portfolio drop. Discipline allows you to be committed in the face of surprising and scary events. How you spend your money is far more important to your happiness than how much you spend. There are a few proven money principles (from the book Happy Money) that can increase your happiness. 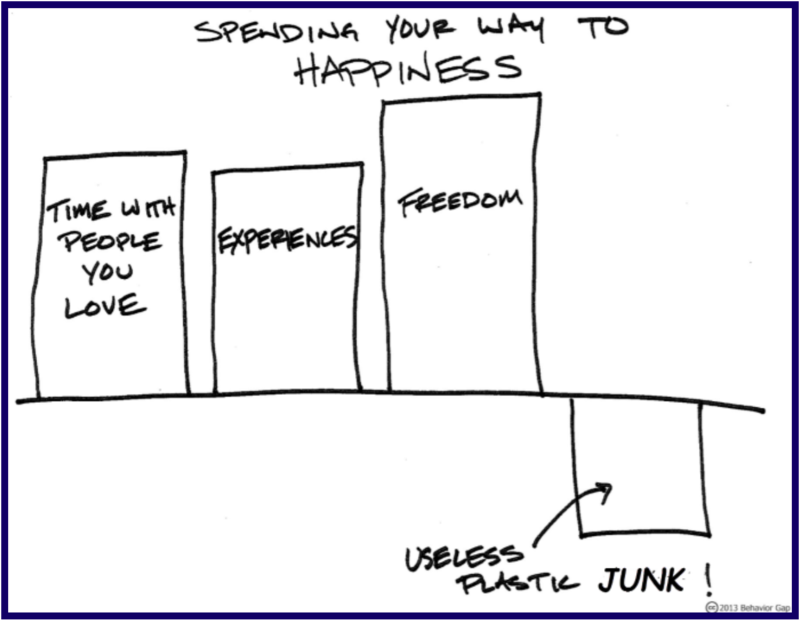 First, spend money on experiences with those you love, not on "useless plastic junk". Consider how you would feel after five years, having spent $2,500 on a TV versus $2,500 on an adventure hiking in the Adirondacks with your son or daughter. Which will give you lasting happiness? Second, make spending on things you enjoy a "treat", not a daily occurrence. Third, “buy time” by using your money to free up your own time to focus on activities and people that you enjoy. For example, you might hire a lawn service so you can spend time with your family. Fourth, delay your consumption and enjoy the anticipation of your spending. Isn't the anticipation of Christmas morning more exciting than the actual opening of the gifts? Finally, spend your money on others as it actually provides a bigger "happiness boost" than spending money on yourself.